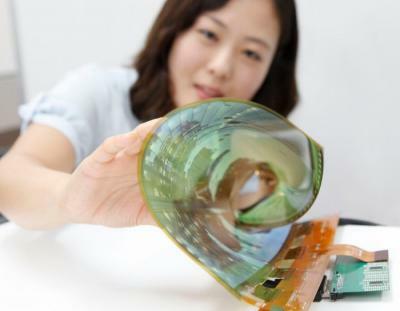 According to the Korea Times, LG Display is set to demonstrate 77" rollable OLED panels at CES 2016 (which will take place in Las Vegas, on January 6-9). LG already announced in September that they will bring 55" rollable OLED prototypes to CES - but obviously a 77" rollable panel will be much more impressive! Back in 2012, LG Display was awarded a project by the Korean government to develop 60" UHD flexible and transparent panels by 2017. Later in February 2014, LGD said it is still on target for this project, and in July 2014 the company demonstrated 18" flexible (shown below) and transparent OLEDs. In CES 2015 LG announced a bendable TV, the 77" EG9900 - but it wasn't launched commercially yet. The company also developed 0.97-mm flexible OLED "wallpaper" TVs that attach magnetically to a wall and can be "peeled off". Of course a plastic-based rollable TV is much more exciting than today's thin curved/bendable panels. What would make demand for this take off. An LG Display official said, "We are already holding key technologies to develop rollable OLED displays. But the market demand has yet to catch up with our expectations. That's why we are still considering whether to mass-produce the rollable OLED panels." The future of this technology is not, I believe, in making the individual panels bigger. Rather they need to be tileable. If they were designed such that you could seamlessly align blocks of these displays with a single external I/O device that would scale the input then if, say, they released a 2K 55" display for $2,000 you could have 110" 4K display for $8,000, of even a 165" 6K display for $18,000 (granted the I/O device for handling more than 4k might add a couple hundred but Displayport 1.3 at least could easily handle the bandwidth). That's roughly the size of a wall in a small room for less money and at higher resolution than most of the boutique 100"+ flat screen TVs. Thanks for the report Ron!